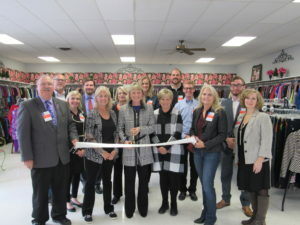 Chamber Ambassadors celebrated with Hoity Toity/Little Darlins Resale at their new location on Oct. 26, 2018. Hoity Toity/Little Darlins Resale is an upscale consignment shop that offers sizes 0-3X. Located at 8th and Maine in the District, they are open Monday-Saturday 10AM-5PM. Call (217) 224-8648 or find them on Facebook for more information. 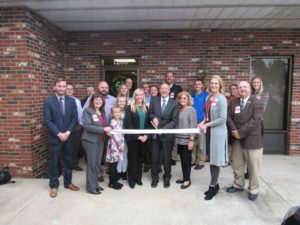 Chamber Ambassadors celebrated alongside Encompass Life & Wealth Strategies on Oct. 25, 2018 as they revealed their remodel at 1200 Hampshire St. Encompass Life & Wealth Strategies is a full-service financial services firm located in Quincy, Illinois, serving clients in the tri-state area of Western Illinois, Northeast Missouri and Southeast Iowa as well as across the nation. They provide comprehensive financial planning services including retirement, education and estate planning. Call (217) 209-3916 or visit www.encompasslifeandwealth.com for more information. 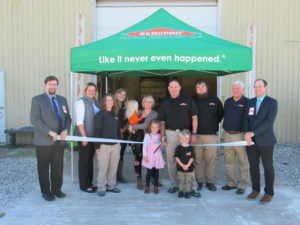 Chamber Ambassadors celebrated on Oct. 18, 2018, with SERVPRO of Quincy at their new location while celebrating 10 years in business. 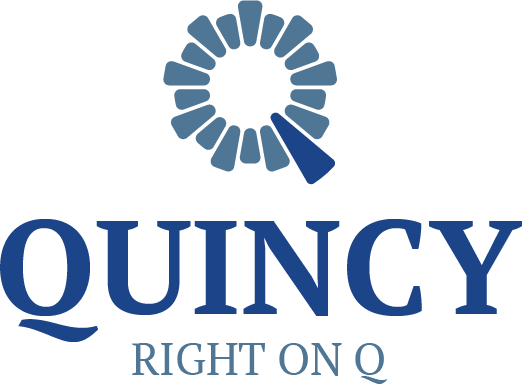 SERVPRO of Quincy specializes in fire, water, carpet cleaning, duct cleaning and janitorial. SERVPRO of Quincy, 2808 Ellington Rd, is open for 24 hours service. For more information, call (217) 223-2993 or click here to visit their website. 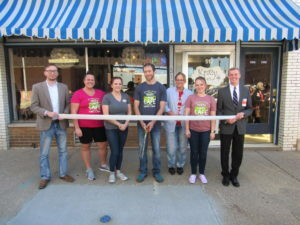 Chamber ambassadors held a ribbon cutting Oct. 4, 2018 to welcome new business Barhop Design to Quincy. Barhop Design is a multifaceted digital studio that offers website and logo design, signs, branding and other resources for your company’s advertising. For more information, call (636) 402-4777 or click here to visit their website. 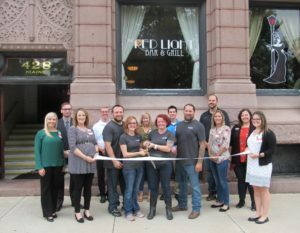 Chamber Ambassadors celebrated on Oct. 5, 2018, for the grand opening of The Red Light Bar & Grill. The Red Light Bar and Grill specializes on stuffed burgers and old-fashion beverages. The Red Light Bar & Grill, 428 Maine St., is open Tues – Thurs 11 a.m. – 2 p.m., and 5 p.m. – 10 p.m.; Friday and Saturday 11 a.m. – 1 a.m., and Sunday from 9 a.m. – 10 p.m. For more information, call (217) 214-7331 or click here to visit their Facebook page. 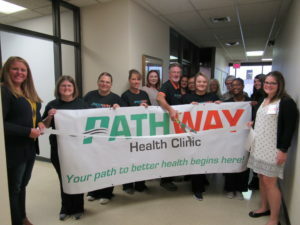 Chamber Ambassadors celebrated on Oct. 5, 2018, with Pathway Health Clinic on their new name and brand. Pathway Health Clinic, located on the second floor of the First Mid Bank & Trust building at 636 Hampshire St., provides a variety of women’s and men’s health services at an affordable price. All services are performed by experienced area physicians and certified nurse practitioners. For more information, click here to visit their website, or call (217) 224-6877. 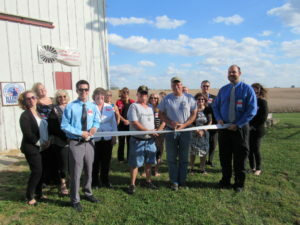 Our Ambassadors celebrated on Oct. 3, 2018, with new business Windy Hills Farm & Garden! Located at 4927 Baseline Road, they grow hops, produce, and make popcorn. Windy Hills is veteran-owned and operated–Homegrown by Heroes. 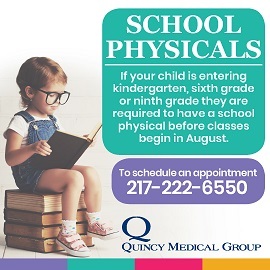 For more information, call (217) 917-3602 or click here to visit their Facebook page. 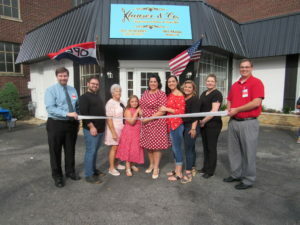 Chamber Ambassadors celebrated on Sept. 27, 2018, with Krazy Cakes Cafe and Bakery’s new owner Brian Lash. Krazy Cakes Cafe and Bakery serves both breakfast and lunch. They also create wedding, novelty and custom cakes, corporate breakfast/ lunches and fundraising items. Krazy Cakes Cafe and Bakery, 512 Hampshire St, is open Tuesday through Friday from 7 a.m. to 2 p.m., on Saturday from 8 a.m. to 2 p.m. For more information, call (217) 222-2253 or click here to visit their website. 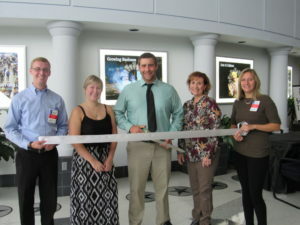 Chamber Ambassadors celebrated on Sept. 21, 2018 with Klauser & Co. Salon & Day Spa at their grand opening. Klauser & Co – Salon & Day Spa provides: cut, color, special occasion hair/ make-up, facials, gel polish manicure, pedicure and massage. Klauser & Co – Salon & Day Spa, 901 Maine St, is open Monday – Thursday 9 a.m.-7 p.m. , Friday 9 a.m. – 6 p.m. and Saturday 9 a.m. – noon. For more information call (217) 214-2473 or click here to visit their Facebook page. Congratulations to new business Love It or Leave It, located at 702 Maine St. in The District! Love It or Leave It is a consignment shop with men’s, women’s, and children’s clothing; purses, bags, shoes, home décor, jewelry, and more. They’re open Tuesday through Friday from 10 a.m. to 4 p.m., and on Saturdays from 9 a.m. to 4 p.m. For more information, call (217) 222-7009 or click here to visit their Facebook page.